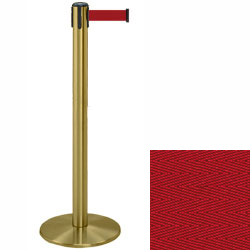 These brass stanchions with maroon belt make ideal crowd control posts when placed in restaurants and other high traffic locations. 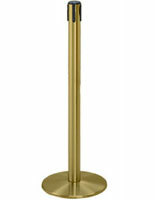 Each of the posts has a floor standing design and a satin finish that will match any environment. 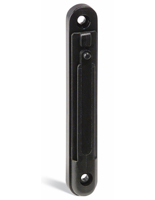 This type of brass stanchion features a retractable band that measures 7.5" long and 2" wide. 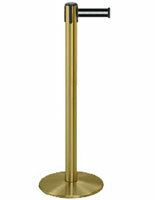 The floor standing posts measure 38" tall and they each have a 13.5" diameter weighted base for extra stability. The satin stanchions for restaurants and airports feature a 4-way adapter that allows them to connect to other posts.